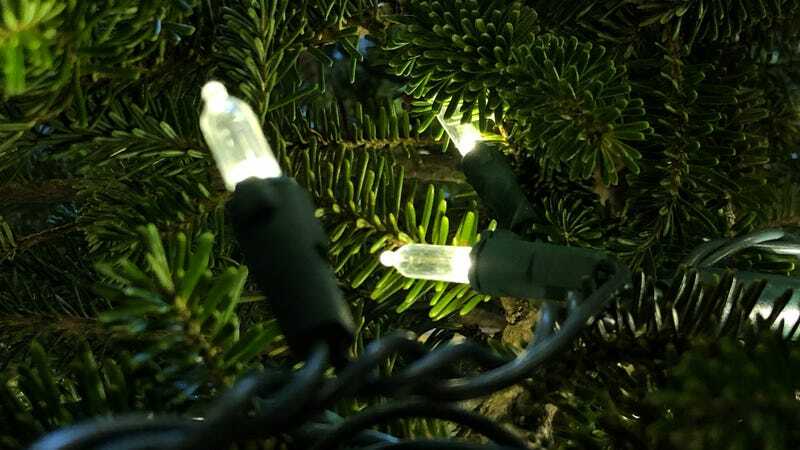 You’ve probably replaced every other light bulb in your home with an LED by now, but this holiday season, don’t forget to do the same with your holiday light strands. I splurged on a few strands of GE’s warm white Colorite Christmas tree lights last year (now $20 each, I believe I paid $25 last year), and will never look back. Each 100 bulb strand uses less than 7W of power—probably less than you use to charge your phone at night—while an equivalent incandescent strand draws about 40W. Some back of the napkin math suggests that running 10 incandescent strands for six hours per day for about a month would cost about $10, while the LEDs would cost less than $2. Plus, the LEDs should last for decades, and if one bulb does burn out, it won’t affect the rest, so they will likely pay for themselves, eventually. But you can’t put a price on feeling like you’re helping the planet, or at least making up for the fact that you literally had a tree killed to decorate your living room. But how do they look? They’re maybe just a twinge cooler than incandescents, but as long as you don’t mix and match different strands, you’ll never notice a difference. They look like Christmas tree lights, and bonus, they don’t get hot either. The GE Colorites are available in both warm white and multicolored, if you’re a masochist, and other bulb sizes and strand lengths are available as well.